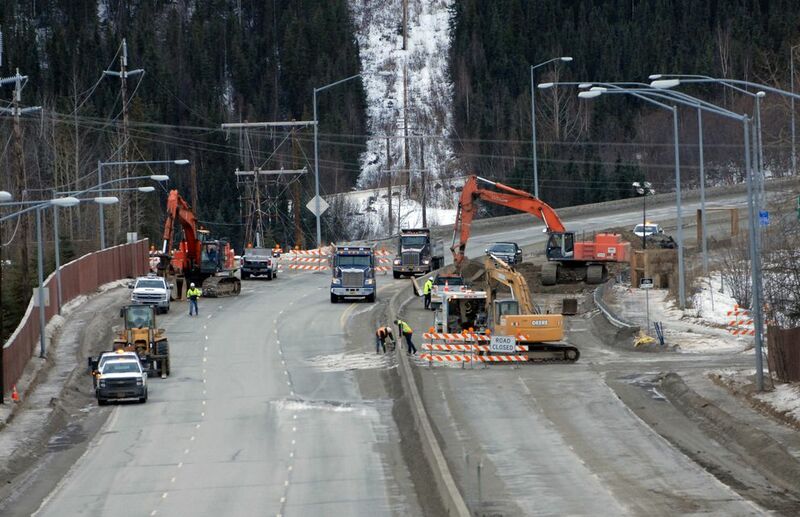 State transportation crews are still working to fix major earthquake damage to roadways in the Anchorage area, but it is getting easier to get around, officials said Sunday. Still, the Department of Transportation is still warning people to avoid the Glenn Highway and Seward Highway if possible, especially for the Monday commute. • Minnesota Drive northbound at International Airport Road, as well as the on-ramp at that exit. • One lane closed on Minnesota Drive southbound at Dimond Boulevard to 100th Avenue. • One lane closed on Dowling Road westbound from Elmore Road to Lake Otis Parkway. • One lane closed in either direction on the Glenn Highway from Mirror Lake to the Eklutna area. “All of those roads are passable; they are just throttled down,” Falsey said. • The intersection at Third Avenue and Post Road near downtown, closed for water utility work. 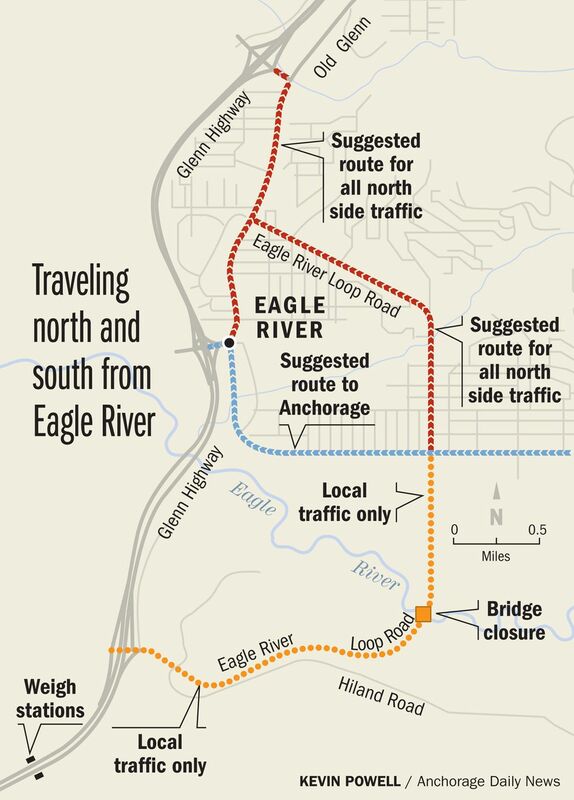 • Eagle River Loop Road at the Briggs Bridge is still closed for a water line repair and will likely remain closed for at least a week, officials said..
Top of the list to fix is the Mirror Lake exit off the Glenn Highway, said Shannon McCarthy,a spokeswoman for the Alaska Department of Transportation. Transportation officials said Sunday that massive dirt-moving work at several damage sites has been completed, and a few are close to being repaired — as soon as the asphalt is ready. 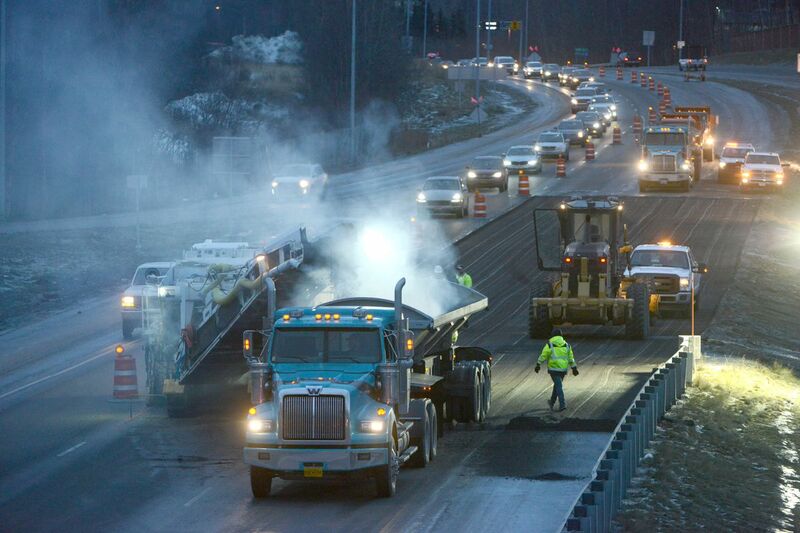 Getting hot asphalt ready in the winter is a difficult, lengthy process, said McCarthy. It can take up to seven days normally, but crews have been racing to prepare the asphalt. “After the earthquake they literally ran over and turned on the machines” to start the process, she said. 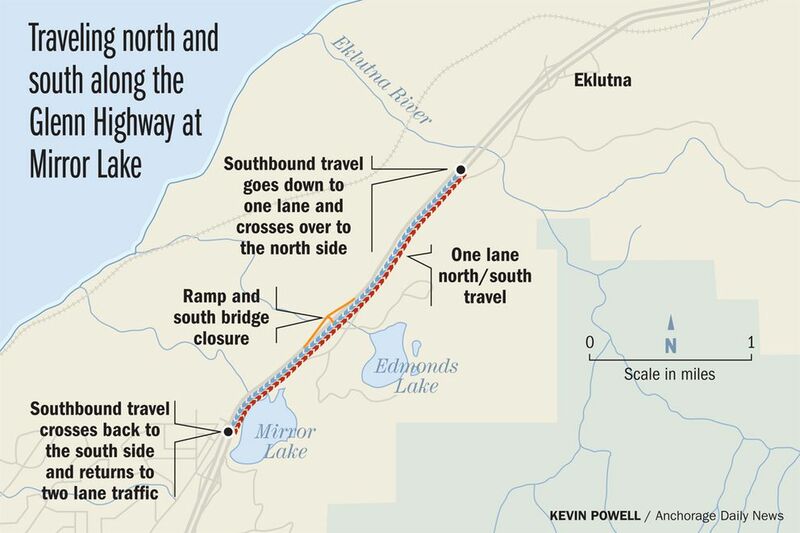 The DOT thinks it can start paving at the Mirror Lake exit of the Glenn Highway and at the damaged ramps from Minnesota Drive to West International Airport Road in Anchorage as soon as Monday morning, she said. Forecast snow might put a damper on things. Striping work on the roads would also be hampered by wet and snowy weather, she said. “We have some significant challenges, especially with snowing," she said. On Sunday, the Matanuska-Susitna Borough said a dramatically fractured section of Vine Road remained closed and asked people to stay away. “Debris on Vine Road is not safe for pedestrians and sightseers, please avoid that area,” the borough said in a statement on its Facebook page. Don’t drive to Anchorage unless you really need to, the borough advised Mat-Su residents. Transportation officials also want people to avoid the Seward Highway between Anchorage and Girdwood if possible. Dangerous rockfalls between Miles 104 and 114 of the highway have continued since the quake, McCarthy said. High winds and aftershocks have contributed. The rock falls have been so frequent the DOT has a work crew stationed on the highway, ready to sweep away the rocks when they fall. Reporter Madeline McGee contributed to this story.